Have you ever heard of water marbling? In my search for holiday nail ideas I found that it’s all the rage for nail designs. People follow this same technique, but instead of dipping glasses they dip their nails. So cool! I love the effect and started dipping all kinds of stuff – fingernails, ornaments and these Dollar Store wine tumblers. 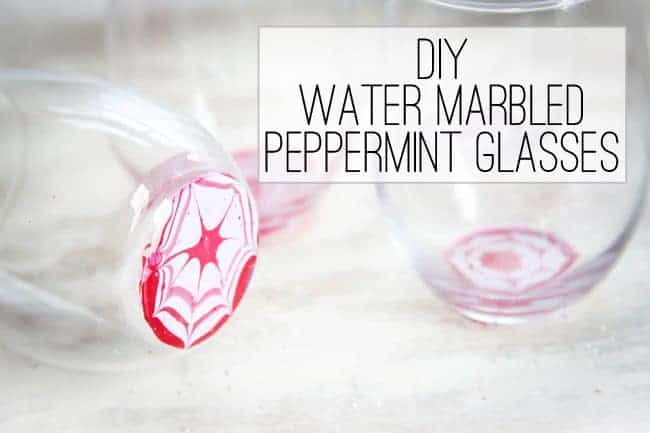 With red and white fingernail polish you can make a festive peppermint design! Something to dip. I got these glasses a few months ago at the Dollar Store. Love these glasses! They are super sturdy because the glass is pretty thick. Red and white nail polish. I used my favorite Sally Hansen Xtreme Wear red and white. Note: some polishes work better than others. My Essie polishes didn’t work at all. Glass of room temperature water. The temperature is very important! If the technique isn’t working for you it’s probably because your water temperature isn’t right. Step 1: Start by putting a drop of red polish in the water. It should spread out over the top. If the polish sinks or doesn’t spread, then try a different polish or recheck your water. Step 2: Keep alternating the red and white polish until the design is big enough to cover what you want to dip. The more polish you add the bigger the design will get. Step 3: With your toothpick, draw out the peppermint design VERY carefully. Try to not break the surface of the polish with the toothpick. Just barely skim the polish to draw the design out. Step 4: Now you’re ready to dunk! Dip the glass into the water and carefully pull it out. If you’re using a smaller glass or a bigger container of water, then you might want to tape off the glass. But you can clean up any edges with nail polish remover. Each glass has such a unique look! So many fun patterns to try! What would you dip? Love this idea! What a great way to use up nail polish that’s in the bottom of the bottle but can’t really reach. What a clever idea! 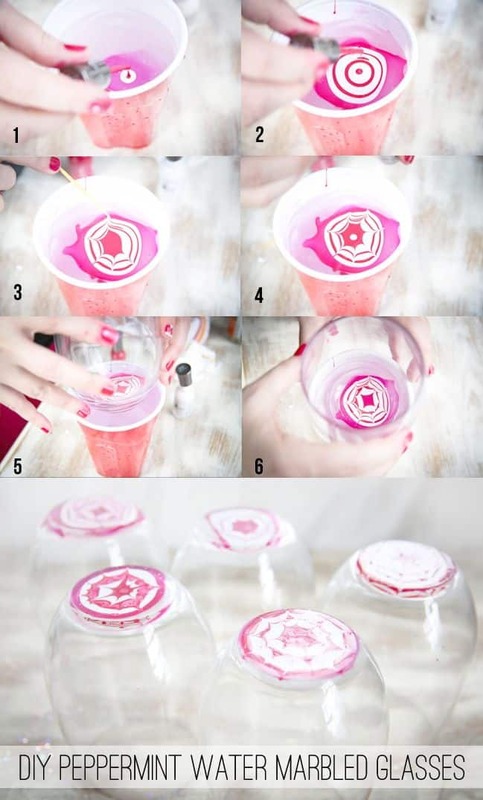 Great way to use up the nail polish that’s at the bottom of the bottle. I love these, but I’m wondering what happens when you wash them? I assume they are not dishwasher safe, but does the pattern stay after washing the glasses? Yes, you should definitely hand wash. They have held up surprisingly well to washing – the only thing that has been able to remove the color so far is nail polish remover. These look amazing Steph – what a crafty lady you are! I love this! Very festive and also do-able. Thanks for sharing. 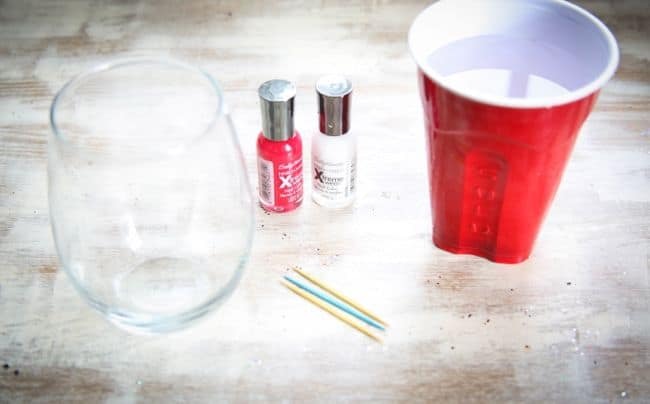 I would have never dreamed to dip a glass in water with nail polish. yeah, me neither! And I would definitely would never have thought of painting my nails this way! This is so awesome! These are the kind of DIYs that look so fun to me! I definitely need to try this sometime! This is such a fun cheery project. I’m surprised that there was such a difference in whether specific nail polish brands would work on the glasses. Interesting. This is a great DIY gift idea! Whaaaaaaat. This is so cool!!!!!!!!!! Oh how cool! The patterns are so beautiful! These are so unique and pretty. What a fun gift idea! Love it! Will have to google dipped nails now too! Wow! I had never heard of this technique before… so pretty! What a cool idea! I wonder if I have time to whip some of these up before our Christmas party on Saturday?! Wow!! What a great idea! I love this! Great idea!! 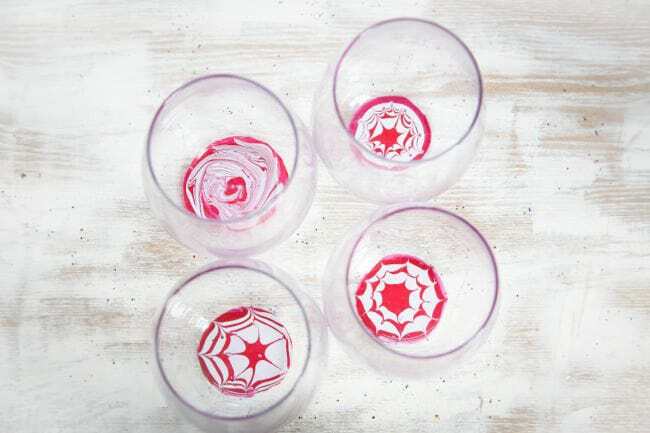 These glasses look so cheery and would make great gifts. This is ridiculously fabulous! I also love the new blog look! these turned out so so cool! I’ve seen the marbled nails, but never thought of dipping glasses. I love how inexpensive this is and how you can customize it for different holidays or just because! such clever and beautiful idea!! thank you!! !